As we age, many of us have more difficulty in maintaining our balance. I think it’s appropriate, then, to take specific actions to help prevent the risk of falling in one of the most dangerous places of all: the home. • Replace all loose scatter mats and rugs to ones with rubber backing to prevent slips. • Wipe up any spills on the floor immediately. • Keep items on shelves in easy reach. • Never climb on a chair or a stool to reach something. • Use only a wide, stable stepladder with deep steps only, or, ask for assistance. • Use non-slip floor wax. • Add “slides” to your chairs so they’ll move more easily when getting up from the table. • Use non-slip mats in the tub or shower, as well as on the floors of the bathroom. • Install “grab bars” by the toilet and in the tub or shower area. • Purchase a non-slip shower or tub bench to facilitate safety in getting in and out. • Install a raised toilet seat to promote ease in getting on and off. 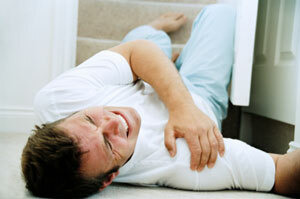 • If possible, install handrails on both sides of the stairs. • Keep the stairs clear of clutter that may cause you to trip. • Install non-slip strips on the edges of each step. • Repair any loose railings. • Secure any loose or wrinkled carpet. • Ensure that the stairs are well-lit. • Be careful in carrying objects up or down the stairs, especially if the object obstructs your view. If you go back to the very first sentence of this article, you’ll see that I mentioned that “as we age, many of us have more difficulty in maintaining our balance.” This is true, particularly for those that don’t maintain the equilibrium and balance centers of the nervous system — that are influenced by spinal alignment. If you truly want to safeguard your health and minimize the possibility of a traumatic fall, make it a priority to have your spine checked and adjusted on a regular basis. That’s the best prevention of all!